Where Your Style Says You Should Go on Holiday in 2018. As we storm into 2018, you’re either doing one of two things; booking a holiday break to cure the winter blues or launching the year with a restyling and the idea that it’s a new year so there’s a new you. But here’s a chance to discover a few 2018 fashion trends, and how they may suit your next break. For those who enjoy being ready for the outdoors and a day in the city, this look combines practicality with style. Staples for this look include a roll neck, shearling jack, a pair of Timberlands, and a trusty parka. In the daytime, you may dress slightly rugged, with plaid shirts, and a chunky knit. But, at night, your style can easily be transformed into a kind of Steve Jobs Chic. This style works best with a holiday that offers both rocks to climb and new-age urban discoveries. The best suited destination? Canada, of course. With its huge landscapes, Canada makes for a huge adventure. Praised for the breath-taking natural world, it’s perfect for outdoor adventurers. Tourists visiting the Great Lakes for its kayaking and watersports activities can easily stop over in either Toronto, Montreal, or Ottawa, thus combining a wilderness adventure with an exciting city-break. Enjoy feeling suited and booted, fresh-faced and sleek? Excellent news, as the polished prince is back. The James Bond tuxedo has always been a party season staple for the suave male. But, looking into 2018, there are many trends that may boost your wardrobe. The eighties style suit cut is back, with wider shoulders and a baggier shape. 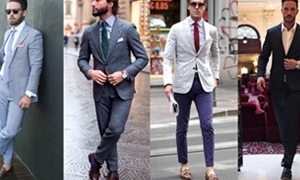 Pastels are making an entrance into the tailors, and pin stripes are still as popular as ever. If you’re feeling a little more daring, silk shirts are coming back on trend this spring. The suited, flashy male needs a holiday destination that allows day-to-night glamour and sophistication. Macau, the autonomous region of the People’s Republic of China, has always been a number one tourist spot for those wanting to partake in the glitter and glamour of the twenty-four hour casinos. The region offers some of the world’s best nightlife, restaurants, and hotels. However, those not wanting to travel the ‘Vegas of China’ to place a bet can try a live casino like Mr Smith online.Play all the Macau favourites, such as Roulette, Blackjack and Baccarat from a computer, mobile, or tablet – and without the jet-lag. Conversely, for those who want to flash the cash and get suited up, book flights to Macau now! Move over the urban fox, street-style has a new soft clean edge. One that you’d be happy to introduce to your mother. Pastels are popular too in this style but choosing the fabric is essential. Softer fabrics, such as suede, velour, and towel have made a resurgence in the past year, especially with street fashion brands. Combining street-wear with tailored accessories has arguably changed the world, or at least the fashion world, and is a key look of this style. Trainers are a necessity so grab yourself a pair of tailored trousers, some Air Jordans, and an oversized duster coat and you’re pretty much there. For your travels, try out Copenhagen in 2018. The European capital for culture of 2017, Copenhagen is perfect for any art and music lover. There are also plenty of hang-out spots for urban dwellers. In last years Guide Michelin Nordic Cities, 16 restaurants in Copenhagen were awarded a total of 20 stars – the highest number ever. And there is plenty of shopping at either Elmegade or Jægersborggade. The latter is known for being buzzing with art galleries, vintage shops, and coffee shops. Great for any urban traveller.